Insert a knife or fork in the eggplant and cook in direct flame for a few minutes. You surely have given us some new recipes..like this recipe..even though I cant try it..what a shame..I am allergic to eggplants. one of my long wish to prepare this :) lovely one ! delicious thogaiyal and my hot favourite. 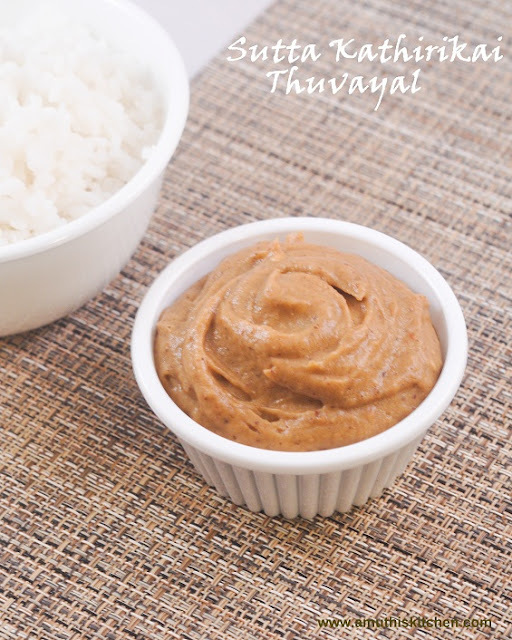 Super flavourful thuvayal, thanks for sharing,will definitely give a try. Good one. My mom makes this authentic chutney! Haven't thought like this. Interesting side dish too. I don't like brinjals but this is my hubby's fav dish. My mil makes this at least once monthly. Looks good! Delicious one. We make this regularly at home. delicious and has a beautiful smoky flavor!!! so delicious!! !